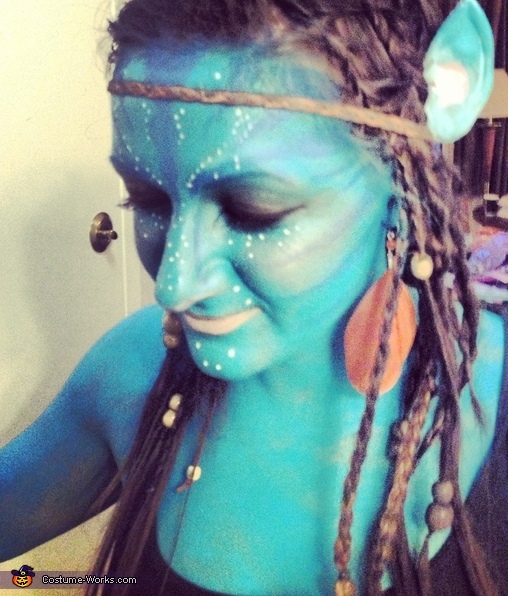 This is my very own home-made avatar costume, obviously inspired by the movie "Avatar". I started out putting clip-in hair extensions (since my hair is only shoulder length) then I braided all of my hair and added beads. Next, I sprayed my hair black (my natural hair is a light brown with blonde highlights). I painted a base coat of blue with Mac body paint, then painted on the stripes and white dots with regular acrylic paint. I bought "elf" ears from a halloween store and painted them myself. Then added a feather earing for a final touch. Wah-la!